What is your race equipment for the Supermarket Street Sweep? I did my first few sweeps borrowing my friend Jacob's Project Rwanda Coffee Bike. 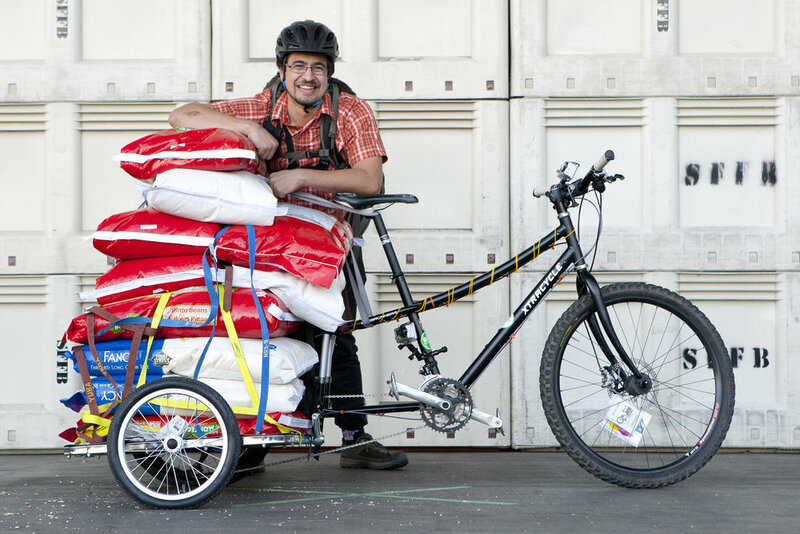 He did a lot of work supporting this organization through fundraising and direct volunteer work while it was active, and had a sample cargo bike they had disseminated to coffee farmers in Rwanda. That thing was a beast and we loaded 400+ lbs. on it. One year I won the cargo bike category and my prize was a prototype Xtracycle EdgeRunner frame that has since become my steed of choice. It's a fun event that supports a fantastic organization. It's a great way to engage the bike community into helping those in need (while having a lot of fun on the side! ), and it's something I look forward to supporting every year. What is the biggest thing you've learned since the first time you participated in the Sweep?How not to load 600 lbs. on a single bike at once and carry it at least 2 miles. Haven't quite figured that out yet. Every year I get closer. Taco-ing my frame while carrying 650+ lbs. for more than a mile from the food bank last year. I still managed to single-handedly drag the bike to the food bank under the time limit, but I trailed a path of beans down a few streets in San Francisco! Can you share a tip for someone considering racing cargo or fundraising for the first time?Borrow a Bikes-at-Work cargo trailer from someone you know! These can easily carry 400+ lbs. of food without breaking a sweat. Also, go through the listed stops on the manifest as fast as you can since carrying that last load of cargo from your last store back to the food-bank can take more than an hour.